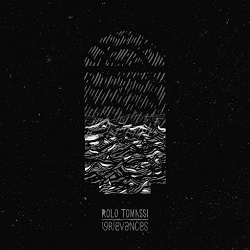 Sheffield metal/math-core act Rolo Tomassi have released their fourth studio album, Grievances. In part it’s you archetypical Rolo Tomassi album, for a band renowned for their abrasive style, Grievances in large chunks isn’t easy on the ear. Yet you have the quieter, expansive moments that give the album a Jekyll and Hyde feel. As per their previous work it is a compelling listen. There are hints of the growth of the band, especially in the quiet and almost post-rock-esque ‘Chandelier Shiver’, while tracks like ‘Prelude III’ and ‘Stage Knvies’ prove that the band can continue to hone their sound and create a great album without moving too far from the tried and tested template. Album opener ‘Estranged’ is a blistering assault to the senses. Moments of full-on intricate guitars pummel you while the quieter moments create a haunting atmosphere. The track segues wonderfully into ‘Raumdeuter’ with its wonderful groove and textured guitars. It’s the first point on Grievances that you get reminded of how well the duel vocals of Eva and James Spence work. Whether it is a snarl or clean vocal the male/female vocals still give Rolo Tomassi that extra, tantalising, texture. ‘Embers’ is a real challenge, the polyrhythmic drumming, intricate guitar work and time signatures make for a cacophony of sounds that don’t lend themselves to an easy listen yet it all comes together wonderfully. ‘Opalescent’ has an experimental Jazz edge and is general toned down a notch. Eva Spence’s vocal comes to the fore on top of some fantastic drumming and while it may not have the intensity of preceding tracks it is every bit as enthralling and comes out as one of the best tracks on Grievances. Similarly ‘Crystal Cascades’ is quiet and almost serene with strings, creating a haunting atmosphere, when the track explodes it does so with unquantifiable emotion and gusto. As the track closes with a down-tempo piano line you get the sense that you’ve just experienced something truly special. As album closers go ‘All That Has Gone Before’ is phenomenal – summarising the textures and nuances of album into an epic 7 minutes is no mean feat, yet the band do it with aplomb. Grievances excels with the new ground tread in the quiet moments and keeps the ball rolling in the more intense moments. It could well be the band’s best piece of work.